The Supreme Court today upheld the death sentence awarded to Pakistani terrorist Ajmal Kasab for the 2008 Mumbai attacks, observing that the conspiracy hatched across the border was �deep, large and vicious,� the case was the �rarest� since independence and any lesser punishment would amount to abolishing the legal provision for the death penalty. In his dealings with Iran�s top leaders, Prime Minister Manmohan Singh must have felt like the ancient Greeks who had to navigate between the mythical sea monsters Scylla and Charybdis. 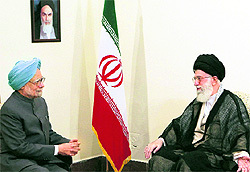 Prime Minister Manmohan Singh meets Iran�s Supreme Leader Ayatollah Sayyed Ali Khamenei in Tehran on Wednesday. When Indian Prime Minister Manmohan Singh and his Bangladesh counterpart Sheikh Hasina sat down for a bilateral meeting on the sidelines of the NAM Summit on Wednesday evening, they were both acutely aware of their respective political limitations that had stymied what they had hoped would have been a historic breakthrough in relations between the countries. Former minister in the Narendra Modi government, Maya Kodnani and Bajrang Dal leader Babu Bajrangi were among 32 persons convicted by a special court today on the charges of conspiracy and murder in the 2002 Naroda Patiya riots case in which 97 persons from the minority community were killed. The Supreme Court today extended the ban on tiger tourism by a month, but clarified that it was not averse to allowing regulated tourist activities under revised guidelines for protecting the wild cat. A Jet Airways flight from Milan to New Delhi made an emergency landing at the Amritsar International Airport to provide medical assistance to an ailing three-year-old girl aboard, but the effort went in vain as the child was declared brought dead, officials said. An English girl has hit the headlines in the UK for embracing the lifestyle of a devout Nihang Sikh. Alexandra Aitken, daughter of disgraced British Cabinet Minister Jonathan Aitken, used to be better known for her addiction to parties and nightclubs.